Why should I purchase Vocation Lessons? How much classroom time is needed to incorporate Vocation Lessons? In Catholic schools, the curriculum takes up one week of religion classes. This is convenient for celebrating National Vocation Awareness Week (the first full week of November). However, it is important to note that the lessons do not have to be taught in a week-long unit. Alternatively, each lesson can stand alone; for example, a teacher may insert the lesson on priesthood when the regular religion curriculum mentions Holy Orders. For parish-based Religious Education, there is one class per year, per grade. This is because we recognize that a great deal of other material must be covered in relatively few class periods (often fewer than thirty classes). For Youth Ministry, there are four meeting options. An ambitious Youth Minister could use 2-4 meeting options in a single year. Most Youth Ministries, however, are likely to have one vocations-themed meeting per year. This way, a ninth grader will cover all the material during his our her time in high school youth ministry. Why are some of the lessons so long, especially in high school? Because teachers love options! For example, the teacher can use his or her judgement (based on the students in that particular class) to assign a challenging reading, or perhaps watch and discuss a video. Some lessons can be spread over two or more class periods, if desired. Can an individual parish or school purchase Vocation Lessons? Yes. The cost is $100 per parish and $400 per school, with a 15% annual maintenance fee. However, we recommend that before you purchase Vocation Lessons for your institution, contact your diocesan Vocation Director to see if he has plans to purchase a license for the entire diocese. Why do you use the term Religious Life instead of Consecrated Life? We primarily use the term Religious Life because more than 95% of people called to Consecrated Life are religious brothers and sisters. We do, however, make mention of consecrated virginity as a vocation in the high school curriculum. I have a suggestion for a change or improvement. How can I collaborate with other diocesan offices to launch Vocation Lessons? 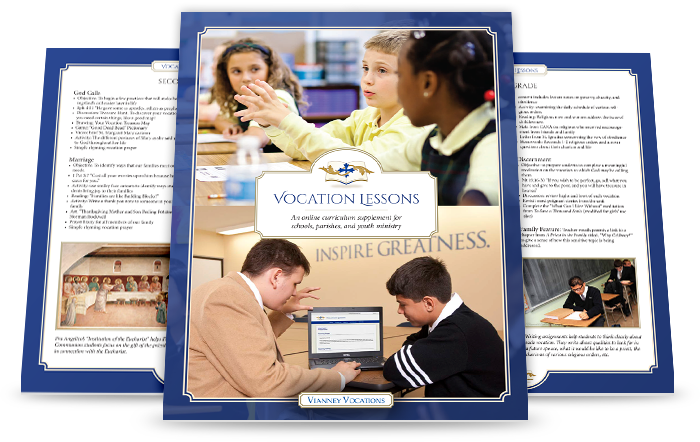 If your Vocation Office is interested in purchasing Vocation Lessons, it is an opportunity for collaboration among the Catholic Schools Office, the Religious Education Office, and the Youth Ministry Office. One way to begin this collaboration is to first meet with your bishop and explain the need for educating students about vocations in a more robust way. This could be followed by a discussion with all the key players in the chancery. How can I launch the curriculum in schools and parishes? This can be done in a number of ways. One way is for the Vocation Director to address a gathering of all Catholic school principals to explain the curriculum, and ask them to introduce it to teachers at their schools. The same can be done with gatherings of DREs and Youth Ministers. Printed materials are available that explain the curriculum, which can be mailed to all schools and parishes. The materials can include your diocesan access codes. If you have an email list of principals, DREs, and youth ministers, we recommend that you email them the access code and explain the curriculum. It’s important to be reasonable when introducing the curriculum; not every single teacher and catechist will use the material right away. The idea is that over time, you will continue to remind them of this important resource. We recommend annual or bi-annual reminders (which we can handle for you, if needed). One final idea—if you have the support of your bishop, you can ask him to be the spokesman for the launch of Vocation Lessons. For example, he could write an editorial for your diocesan newspaper, or a letter to teachers, catechists, and youth ministers. Do you offer workshops for Catholic educators? Yes! We can run a workshop for principals, catechists, DREs, and/or youth ministers. The workshop explains the rationale behind the curriculum, and demonstrates how to use the lessons via a PowerPoint presentation of the web site. How do the access codes work? After purchasing, your diocese will receive two unique access codes, one for teachers & catechists, and one for students. These codes are the same for everyone in your diocese. Can I purchase Vocation Lessons only for Catholic schools, and not for Religious Education? Or vice-versa? Yes. But we hope you’ll view Vocation Lessons as a standard feature in your entire education system—schools, religious education, and youth ministry. What if the curricula in Catholic Schools seems too full to add a supplement like Vocation Lessons? Discerning one’s vocation is so important that it should be reflected in a Catholic school’s curriculum. We designed Vocation Lessons to be flexible, so each lesson “stands alone” and can be taught at a time of year that meshes appropriately with existing curricula. We believe that helping students to discern their vocations should be a critical part of the mission of Catholic schools. Of course, schools should prepare students to have successful careers and be responsible citizens—but even more importantly, schools should also help them to discover their vocations, their primary missions in life. In Catholic schools, the curriculum takes up one week of religion classes. This is convenient for celebrating National Vocation Awareness Week (the first full week of November). However, it is important to note that the lessons do not have to be taught in a week-long unit. Alternatively, each lesson can stand alone; for example, a teacher may insert the lesson on priesthood when the regular religion curriculum mentions Holy Orders. For parish-based Religious Education, there is one class per year, per grade. This is because we recognize that a great deal of other material must be covered in relatively few class periods (often fewer than thirty classes). For Youth Ministry, there are four meeting options. An ambitious Youth Minister could use 2-4 meeting options in a single year. Most Youth Ministries, however, are likely to have one vocations-themed meeting per year. This way, a ninth grader will cover all the material during his our her time in high school youth ministry. Yes, you can download two brochures on our resource page. If you want printed copies, drop us a line and we’ll mail you some. This can be done in a number of ways. One way is for the Vocation Director to address a gathering of all Catholic school principals to explain the curriculum, and ask them to introduce it to teachers at their schools. The same can be done with gatherings of DREs and Youth Ministers. Printed materials are available that explain the curriculum, which can be mailed to all schools and parishes. The materials can include your diocesan access codes. If you have an email list of principals, DREs, and youth ministers, we recommend that you email them the access code and explain the curriculum. It’s important to be reasonable when introducing the curriculum; not every single teacher and catechist will use the material right away. The idea is that over time, you will continue to remind them of this important resource. We recommend annual or bi-annual reminders (which we can handle for you, if needed). One final idea—if you have the support of your bishop, you can ask him to be the spokesman for the launch of Vocation Lessons. For example, he could write an editorial for your diocesan newspaper, or a letter to teachers, catechists, and youth ministers.